The name tells you just about everything you need to know about members of the family Notonectidae. Backswimmers do just that – they swim upside down, on their backs. The scientific name Notonectidae originates from the Greek words notos, meaning back, and nektos, meaning swimming. A backswimmer is built like an upside down boat. The backswimmer's dorsal side is convex and V-shaped, like the keel of a boat. 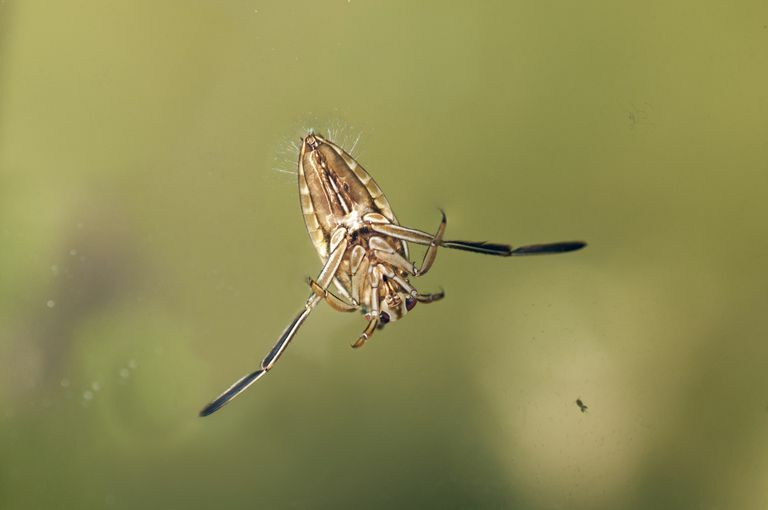 These aquatic insects use their long back legs as oars to propel themselves across the water. The rowing legs lack claws but are fringed with long hairs. The backswimmer's coloration is the opposite of most insects, presumably because they live their lives upside down. A backswimmer typically has a dark belly and a light-colored back. This makes them less conspicuous to predators as they backstroke around the pond. The backswimmer's head is typical of an aquatic true bug. It has two large eyes, positioned close together, but no ocelli. A cylindrical beak (or rostrum) folds neatly under the head. The short antennae, with just 3-4 segments, are almost hidden below the eyes. Like other Hemiptera, backswimmers have piercing, sucking mouthparts. Adult backswimmers bear functional wings and will fly, though doing so requires them to first exit the water and right themselves. They grasp prey and cling to aquatic vegetation using their first and second pairs of legs. At maturity, most backswimmers measure less than ½ inch in length. Backswimmers prey on other aquatic insects, including fellow backswimmers, as well as on tadpoles or small fish. They hunt by either diving down to catch submerged prey or by releasing their hold on vegetation and simply drifting up under prey above them. Backswimmers feed by piercing their prey and then sucking the fluids from their immobilized bodies. As all true bugs do, backswimmers undergo incomplete or simple metamorphosis. Mated females deposit eggs in or on aquatic vegetation, or on the surface of rocks, usually in spring or summer. Hatching may occur in just a few days, or after several months, depending on the species and on environmental variables. Nymphs look similar to adults, though lack fully developed wings. Most species overwinter as adults. Backswimmers can and will bite people if handled carelessly, so use caution when skimming specimens from a pond or lake. They've also been known to bite unsuspecting swimmers, a habit for which they've earned the nickname water wasps. Those who've felt the wrath of the backswimmer will tell you their bite feels quite like a bee sting. Backswimmers can stay underwater for hours at a time, by virtue of a portable SCUBA tank they carry with them. On the underside of the abdomen, the backswimmer has two channels covered by inward-facing hairs. These spaces allow the backswimmer to store air bubbles, from which it draws oxygen while submerged. When oxygen stores become low, it must breach the surface of the water to replenish the supply. Males of some species possess stridulatory organs, which they use to sing courtship overtures to receptive females. Backswimmers inhabit ponds, freshwater pools, lake edges, and slow-moving streams. About 400 species are known throughout the world, but only 34 species inhabit North America. Family Notonectidae - Backswimmers, BugGuide.Net. Accessed February 25, 2013. 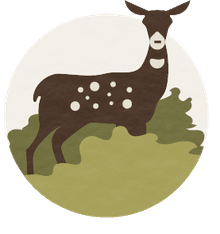 Aquatic and Semiaquatic Heteroptera of Michigan - True Bugs - Identification, a website by Ethan Bright, University of Michigan. Accessed February 8, 2016. Water Boatmen and Backswimmers, University of Wisconsin-Milwaukee. Accessed February 25, 2013. Notonectidae - Backswimmers, by Dr. John Meyer, North Carolina State University. Accessed February 25, 2013. A Dictionary of Entomology, by Gordon Gordh, David H. Headrick. Should You Fear Hobo Spiders? What Are the Distinguishing Traits of Bess Beetles?